Chronicle - Trachtenkapelle Lech - mehr geht nicht! 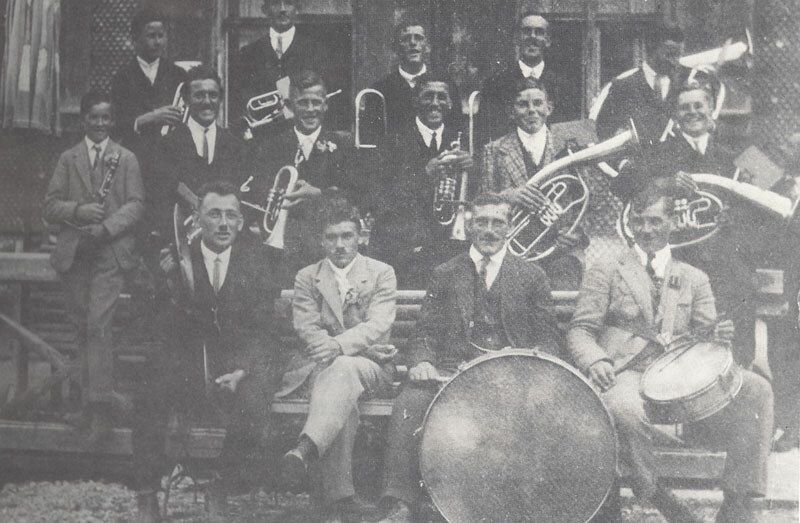 In 1927 after attending a music festival in the Bregenz Woods, Engelbert Wolf and Meinrad Zimmermann had the notion to establish a town band in Lech. So they gathered together a few young people between 16 and 19 years old and met in the Hotel Krone to discuss the idea. Despite overwhelming enthusiasm it was plain that the necessary outlay would just not be affordable. The next obvoius step was to approach Mayor Anton Walch, who declared that something so "immoral" was just not up for discussion and furthermore, for that, there was no money in the municipal coffers. When the proprietor of the Hotel Krone, Wilhelm Pfefferkorn, heard of this conversation he responded: "If it`s only about money, that`s not a problem. I`ll stand as guarantor". So a loan was taken out, instruments were ordered, and the band was ready to go. Except two details were still missing: a bandleader and the musical scores. 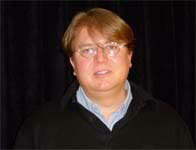 The person found to manage both was Johann Marinelli, from Au. He moved to Lech, taught all instruments and notated all the musical scores. In return he was provided with accommodation. After three years of preparation the band appeared publicly for the first time in a parade in Nofels. Naturally, all wanted to appear reasonably uniform but no one owned the traditional costume. So each wore his best suit and identical hats with a decorative feather were bought; without saying, on credit. The first chairman of the band was Hubert Walch and in 1929 Leopold Schneider succeeded him. The early appearances of this young band were limited to a few church festivities and wedding ceremonies. They struggled through like this until the beginning of the Second World War. 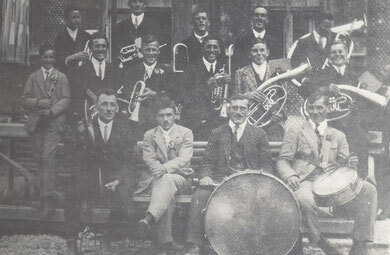 During this time playing activities were called to a halt as the musicians were enlisted in military service. Several musicians fell victims to the horrors of the war, among them bandleader Johann Marinelli. In 1947 the band began to play again with Martin Wolf as chairman and Edgar Steffko as bandleader. One year later the "Town Band Tannberg" evolved into the "Traditionally-Costumed Lech Band". Naturally, a traditional costume was then required; which the new chairman, Johann Schneider strongly pressed for. Up until 1997 the traditional costume had hardly altered, apart from the waistcoat which changed colours from red to white in 1980. In 1950, after a long search, Ignaz Erne was appointed the new bandleader; a position he held until 1960. 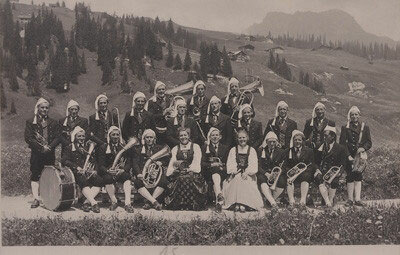 In 1951 the first Arlberg Music Festival took place at Rüfikopf Square in Lech. Since then St. Anton, Klösterle and Wald alternate with Lech hosting this customary music festival. In 1959 the band`s practice room went up in flames and almost all of the band`s instruments were lost. Following rapid negotiations with the insurance company new instruments were able to be purchased within one week. 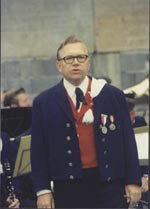 Between 1961 and 1967 the town band played under the direction of Bandleader Ludwig Neururer. The first noticeable musical upturn took place in 1968 with the appointment of Bandleader Hans Finner. As he said at the time, he was stirred into "getting this bunch of musical no hopers into proper shape". And this he actually achieved by industriously engaging the young and countless practices. In 1975 Peter Burger undertook the position of chairman which he carried out until 2003. In 1978 the band moved location into the newly built school. In 1990 the transfer of the baton from Hans Finner sen., who passed away far too early, to his son Hans Finner jun. took place. With his immense capability, with much patience and application at practices the remaining dormant musical potential of the band was drawn out. 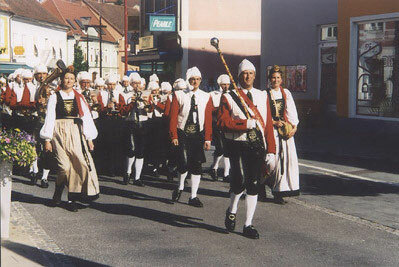 With its many concerts and appearances in Lech, throughout Austria, and abroad the traditionally-costumed band has become an important promoter and cultural representative of the town. In the summer of 1997 the band was outfitted with a new Walser (the traditional regional) costume. On January 1, 2000 there was a change of bandleaders. 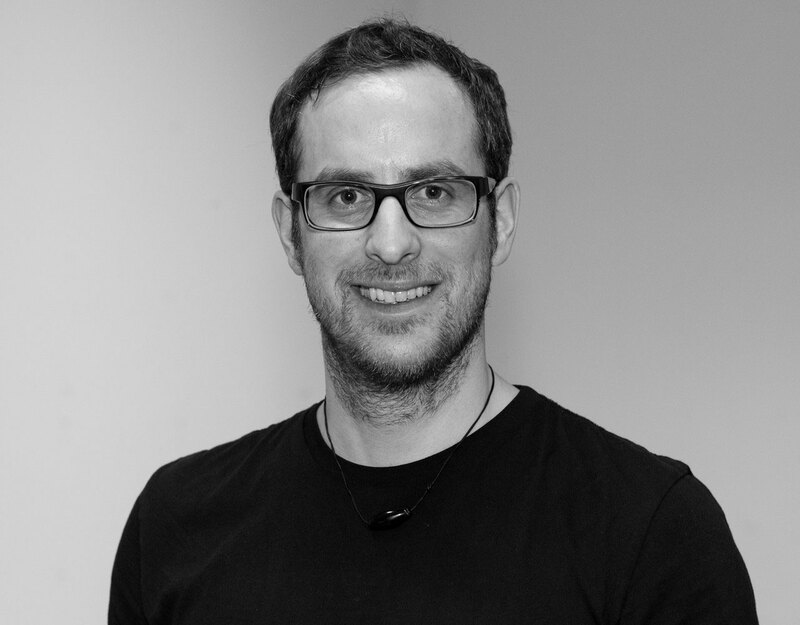 Marco Walser from Göfis, followed Hans Finner. 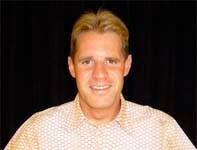 In May 2003 Marco Walser laid down the post and Marc Gusner took over the leadership of the band. In the elections of that year a change of generation in the management of the band occurred. After many long successful years, Chairman Peter Burger and Vice-chairman Kurt Jochum placed their functions and responsibilities in younger hands. Stefan Jochum was elected chairman and Günter Schneider, vice-chairman. And in the same year (autumn 2003) the band moved into new luxurious practice rooms, located above the old postgarage. Lech Town Band "in motion"
The unforeseeable, freaky flood in August 2005 (and its massive damage to the tennis centre), resulted in the staging of the 2006 gala concert for the first time in Lech's new church. After adapting to the initial unaccustomed acoustics the concert was a triumphant success. Since then all gala concerts were to take place in Lech's new church. The autumn of 2007 saw the 80th anniversary celebration. The festival band “MaChlast”, specialists in Bohemian/Moravian brass band music, and almost completely comprised of professional musicians were an absolute delight for the local community and naturally also for us. The Lech Town Band could celebrate its 80th birthday with filled to capacity attendance and with its characteristic gusto. The 59th Arlberg Music Festival was held in Lech from July 31 to August 2, 2009. A legendary 64 groups participated in the Sunday parade. Not only was the communal “Monster concert” first-rate but also the musical entertainment provided by the festival band, the Rettenegg Brass Band from Styria, the Jetzendorfer Hinterhof musicians, the Tyrolean Military Big Band, the Wälder musicians, the St.Anton Town Band, the Lech Music School's Rock Pirates, MaChlast and the Grazer Spatzen. One couldn't have wished for anything more! The year 2011 presented itself with a new, interesting opportunity for the staging of the February gala concert. The Burg Vital Resort in Oberlech offered us an ideal concert hall for our annual gala concerts. The almost 300 concert attendees on this first occasion(who put to good use the easy transport connection from the village centre with either the Oberlech cable-car or the Oberlech bus) testified to the broad acceptance of the new location. We are really thrilled that since then the annual gala concerts could take place in a comfortable, air-conditioned hall. Once again enormous thanks to Family Thomas and Hannelore Lucian! With an active membership of 42 musicians, 4 schnapps maidens, 1 banner bearer and with an average age of 26 years old we are in good shape, one which hasn't existed for a long time! We are currently in the midst of practising for our numerous spring and summer performances. 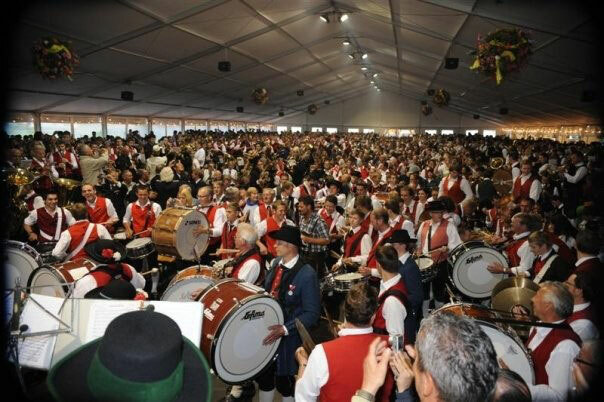 And not to mention this year's highlight, the 63rd Arlberg Music Festival from July 26 – July 28, 2013; which as in previous years is co-ordinated with the Lech Fire Brigade. See the link 63. 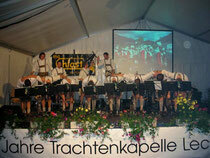 Arlberger Musikfest (in german language only)!